Our inspiration and namesake, Chokgyur Dechen Lingpa, is the greatest and last of the 108 treasure revealers (“tertöns”) predicted by Guru Rinpoche. His astounding revelations, extraordinary realization and impartial love for all sentient beings form the backbone inspiration for our activities. He manifested specially for the benefit of beings of this age, and his enlightened activities are aimed specifically for our time. Guru Rinpoche, also known as Padmasambhava or Padmakara (the Lotus-Born One), introduced Buddhism to Tibet, and further spread Buddhism in Pakistan, Nepal, Bhutan and India. Of central importance for the continuous transmission of the dharma teachings of Guru Rinpoche is the terma or treasure tradition. These spiritual treasures were concealed by Guru Rinpoche and Yeshe Tsogyal in the earth and in the minds of disciples to be revealed at the appropriate time by ‘treasure revealers’ or tertöns. These concealed teachings and practices, specifically intended for people of a certain age, are then revealed when the time is ripe and in this way they also serve the purpose of keeping the dharma pure and protected from modification over the centuries. 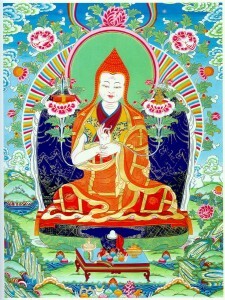 Chokgyur Lingpa (1829-1870) was a contemporary of Jamgon Kongtrul (1813-1899) and Jamyang Khyentse Wangpo (1820-1892). These three great masters were connected to each other as ‘mingled minds’, and performed many great deeds together. 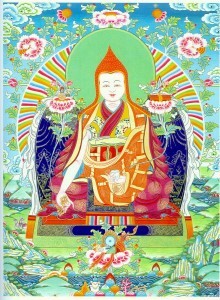 In particular, Khyentse and Chokling had received a prediction [from Padmasambhava] stating, “You possess the karmic continuity of being linked as father and son.” One of Jamyang Khyentse’s previous incarnation was as King Trisong Deutsen, and Chokgyur Lingpa was the incarnation of the second prince at that time, Lhasey Murub Tsenpo. Chokgyur Lingpa together with Jamyang Khyentse Wangpo and Jamgon Kongtrul Lodro Thaye with whom he shared a close mutual teacher-student relationship codified his treasure teachings into forty volumes known as the Chokling Tersar or The New Treasures of Chokgyur Lingpa. These treasures are practiced by followers of both the Kagyu and Nyingma lineages. In recent times this particular lineage has been upheld and practiced by such masters as Tulku Urgyen Rinpoche, the 15th and 16th Karmapas, Dzongsar Khyentse Chokyi Lodro, Dilgo Khyentse Tashi Paljor, the 3rd Neten Chokling Pema Gyurme and so on and continues to be held and transmitted today by their chief disciples. 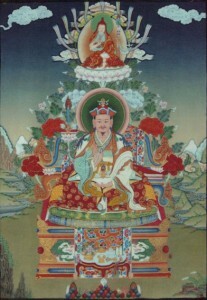 C hokgyur Lingpa was the owner of seven transmissions and is regarded as the universal monarch of all tertöns, the reason being that no other tertön has revealed a teaching that includes the Space Section (Longdey) of Dzogchen. There are several Mind Section (Semdey) revelations and all major tertöns have revealed the Instruction Section (Mengakdey), but only Chokgyur Lingpa transmitted the Space Section. This is why the Three Sections of the Great Perfection (Dzogchen Desum) is considered the most extraordinary terma that he ever revealed. This terma was revealed by Chokgyur Lingpa together with Jamyang Khyentse and Jamgon Kongtrul at Padma Shelpug in Derge. This is only one of their many connected activities. Another example is theGuru’s Heart Practice, Dispeller of All Obstacles (Tukdrub Barchey Künsel) was revealed as an earth treasure by Chokgyur Lingpa and a mind treasure by Jamyang Khyentse, and hence it is a shared treasure between these two masters. These masters also performed many drubchens (great accomplishment prayer ceremonies) together, like the combined drubchen of Barchey Künsel and Sampa Lhündrub Yishin Norbu at Palpung Monastery, Lama Gongdü at Tsari-like Jewel Rock and so on.